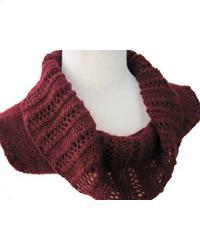 The HeartStrings Cowl Dickey is a quick, easy-to-knit woman’s dickey. The loose-fitting draped neckline results in a comfortable accessory that will fit almost anyone. Treat yourself to a luxury yarn (takes just 200 yards!) and you'll feel like heavenly decadence. Wear it with a plain sweater or shirt to add an exquisite touch.